In December, 1978, Matthew Montfort, Benjy Wertheimer, Mindy Klein and Phil Fong went into Tres Virgos Studio in Mill Valley to record Montfort's song Moonbath. The song became the springboard for the first Ancient Future record, Visions of a Peaceful Planet, which includes five other songs. The record was financed by the group and recorded for under $2500. The record was released as a cassette in May 1979, and then on LP later in the year. Twenty years later, in May 1999, Visions of a Peaceful Planet was reissued as an Internet only release. The first MP3 song from the reissue, "Eternal Embrace," was the Internet's #1 World Music song ( 1999 mpulse.com tracking ). Tres Virgos Studio later moved to San Rafael and was sold to producer Narada Michael Walden, who, despite popular misconception, has absolutely nothing to do with Narada Records, the label that released four Ancient Future recordings in the 1980's and 1990's. CD-R- $19.98 list: Add CD to Cart. Buy CD Now. LP- $35: Add CD to Cart. Buy CD Now. >YTmusic. Jonah and Mariposa at Marin Artists International rescued parts of Ancient Future's first video from archival oblivion. The band's first concert under the name Ancient Future took place to a packed house on February 11, 1979, at the Sleeping Lady Cafe in Fairfax, California. The Sleeping Lady was a vegetarian cafe and music club co-op that was the center of a vibrant local music scene. In the mid 80's, the co-op was seized by a punk rock aesthetic. Somehow, punk rock music and vegetarian hippy food did not prove to be a winning business combination, and the club went belly up. Coincidently, a new version of the club re-opened with the blessing of Sleeping Lady founder Billy Bramblett in fall 2008, exactly 30 years after Ancient Future was formed. It closed seven years later. 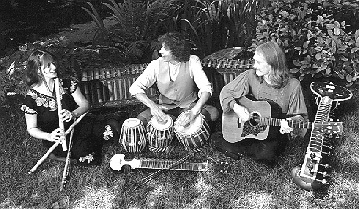 A reunion concert was held on April 19, 2015, and due to the resulting publicity, selections from a long lost video of the original band recorded at the College of Marin before their first concert were found at the Community Media Center of Marin, the local public access television station. Near its inception, Ancient Future performed an impromptu concert at a Mill Valley strip mall where Phil Fong worked at a small music store run by his friend, Paul Bjorgan. Matthew Montfort was checking out some guitars in the music store when Paul asked Matthew to look after the store for a few minutes. A man came in and asked to see a beginner's guitar for a present for a relative. Matthew, in what would turn out to be a very short stint in retail sales, was in the process of selling him the guitar when Paul returned to the store and witnessed the transaction. "Do you know who that was?," Paul asked after the man left. "You just sold the cheapest guitar in the store to Van Morrison!" Not long after that, Van Morrison came to see Ancient Future perform at the Ali Baba Cafe in Mill Valley and was quite enthusiastic about what he heard. A year or so later, Van Morrison spotted Mindy Klein and Matthew Montfort standing in line outside of a sold out concert by the band Oregon at the Great American Music Hall. When told they couldn't get tickets, Van asked them to stay in line for a few more minutes, went into the club, and when he returned Matt and Mindy were ushered in as his guests! In a bit of synchronicity, Van Morrison's parents operated an independent record store in Fairfax, which happened to be one of the very first stores to carry Ancient Future's first recording. The concept for the Natural Rhythms record grew out of a magical spontaneous recording session at a friend's recording studio near a frog pond. When Montfort and Klein noticed the sound of croaking frogs leaking into the studio, they were inspired to record them. Montfort went out to the pond with a zither and began to play. He found that certain rhythms produced musical responses. The music recorded that night was very magical, and eventually became part of the Natural Rhythms album. Several months later, Montfort and Klein went to Bali to study gamelan music. They were amazed to find paintings all over the island portraying Balinese rice paddy frogs playing gamelan instruments. They saw dances imitating the frogs and heard music imitating the frog calls. Montfort and Klein decided to extend their musical experiments to include the Balinese rice paddy frogs. Late at night, they gathered their musical Balinese friends, went out into the rice paddies, and jammed with the frogs. Again, some very magical moments of music transpired. The tapes were taken back to San Francisco, transferred to multitrack tape, and became part of the Natural Rhythms recording. While in Bali, they became very close friends with an amazing Balinese painter named Nyomen Kawiana and his brother, Wayan Ludra. Nyomen Kawiana was inspired to do some paintings depicting frogs playing the instruments of Ancient Future's world music ensemble. He spent three months working on them, and then presented the paintings to his American friends as a gift. He refused payment, since according to his religion, his family would be repaid for his good deed in other ways. Montfort later found out that this did indeed happen. The record turned out to be a milestone for the group, garnering N.A.I.R.D. "Indie" awards in World Music and Album Cover Design. Many years after recording Natural Rhythms, Matthew Montfort and Benjy Wertheimer were invited to perform a duet at the 1986 Oregon Country Fair in Eugene. After their performance, Montfort was surprised to be greeted by a Balinese man. After all, it would take a typical Balinese villager an entire life's savings just to buy a plane ticket to America. On closer inspection, the Balinese man would turn out to be none other than Wayan Ludra, who played kukul on Natural Rhythms, is the brother of cover artist Nyomen Kawiana, and even hand carved an ebony guitar pick for Matthew Montfort. What was he doing in America? It turned out that an Oregonian named Sandra Barger had purchased a copy of Natural Rhythms and fallen in love with it. She had an import/export business that took her to Bali. She was walking through the village of Pengosekan when she heard Natural Rhythms coming from a home. She was quite curious how they came to have a copy of the record and went up to investigate. She met Wayan Ludra and Nyomen Kawiana and was told the story of their American friends who liked to play music with frogs. On this basis quite a connection was made, and she became great friends of the family, later marrying Wayan. She established her business in Bali at the family compound, and brought the whole family great wealth. Nyomen's generosity had come full circle, and had even produced a meeting in America for Wayan and Montfort. CD-R- $19.98 list. Add CD to Cart. Buy CD Now. >YTmusic.